Fireplaces Cape Town - Contact Us - Victorian Fireplaces. 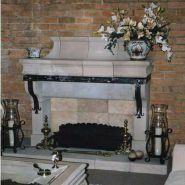 We manufacture Wood Fireplaces, Marble Fireplaces, Sandstone Fireplaces, Open Fireplaces and Braai areas. We also stock repair and maintain Victorian Fireplaces. Due to the fact that Open-type fireplaces are built to order, we also make fire grates and ironmongery work to order, so that they fit the fireplace. We also have fire dogs, old fashioned grates and Victorian fireplaces in stock and a showroom where you are able to view samples. We are also specialising in the manufacturing and customising of chimney pots. Victorian Fireplaces – Cape Town. Fireplaces Cape Town.